The KONG Air Fetch Stick is designed in the shape of a stick, with a rope attached for fun and easy fetch games. The Fetch Stick floats on the water, perfect for dogs who love to get wet. The KONG Air Fetch Stick is designed in the shape of a stick, with a rope attached for fun and easy fetch games. The Fetch Stick floats on the water, perfect for dogs who love to get wet. 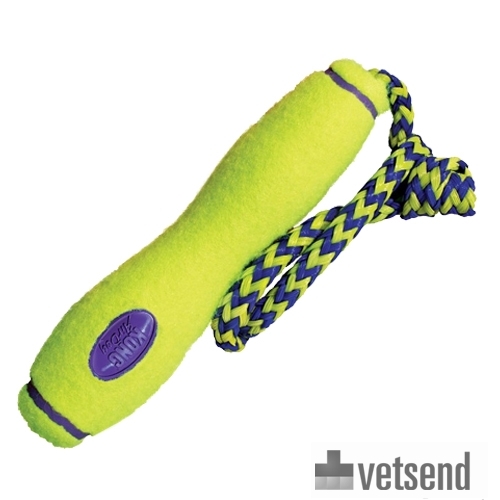 The material of the stick is made of non-abrasive felt and won't cause any damage to your dog's teeth. Use the Air Fetch Stick as a safer alternative to regular sticks. Take a look at the other toys in the KONG AirDog Squeaker range. Have you used KONG Air Fetch Stick before? Let us know what you think about this product.